Bhutan is a small country, full of nature�s grace and mountains nested in the lap of the Eastern Himalayas. Its intermediate neighboring countries are India and China. They share their borders in the south and south west with Indian states of Arunachal Pradesh, Assam, West Bengal, and Sikkim. On the northern and north western side with the Tibet, Autonomous Region of the People's Republic of China. The other close neighbouring countries are Nepal, Bangladesh and Myanmar. 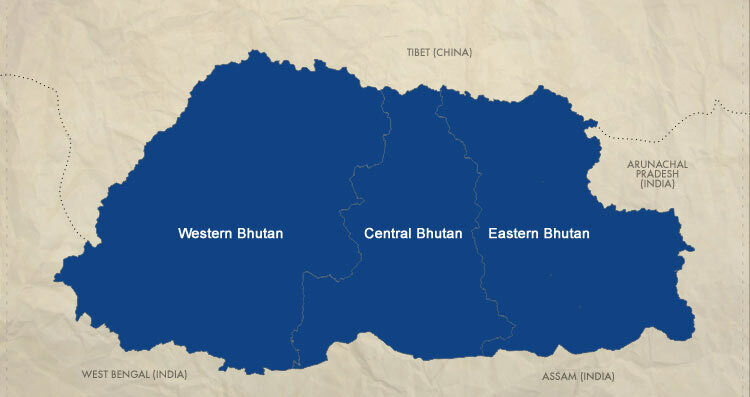 The land of the Bhutan is politically divided into 20 districts called Dzongkhag, which are further divided into 201 villages, cities or towns called Gewog. Bhutan is home to some of the highest mountain ranges especially in the northern part of the country. Weather conditions in the high mountain regions are extreme and difficult.